Browsing through my vintage fashion magazines, I’m amazed at just how many gorgeous ads there were for bras back then. Women in the 1950’s had for the first time the power to change their image, (and potentially their lives, too) by simply purchasing the cosmetics, personal care items and fashionable clothing presented to them in women’s magazines. Advertisers gently persuaded women readers to spend money on themselves by portraying ideal lifestyles, faces and figures – and nothing’s changed much today. Although newspapers and magazines from the past continually ran ads for bras and girdles, the women featured wearing them were either illustrated or the photographs were heavily edited – so they weren’t too “real”. They had great tag lines too, some more memorable than the bras themselves, (and any of you Mad Men fans will know how vital it was then to come up with a good tag line!). In 1949 Maidenform launched one of the first most famous magazine ad campaigns with the “I dreamed of…..” . Running for over 30 years, it depicted a woman dreaming she did something in her Maidenform bra – from the mundane “I dreamed I went shopping in my Maidenform bra” to the exciting “I dreamed I starred on television in my Maidenform bra”. They were seen as mildly scandalous at the time – the first time a model was seen in a bra in a social setting. There were endless head-turning variations of this theme and those ads are still fondly remembered today, even cropping up recently in an episode of Mad Men! During the 1950’s and early 60’s TV ads had to show what a bra could do without actually showing a live woman wearing one! Bras and girdles were regarded as way too inappropriate to advertise on TV and all that could be shown was a female spokeswoman holding samples of a bra while describing its virtues. Even the words “lift and separate” were censored for causing “embarrassment when teen-age boys are around….it starts the imagination”. Mannequins had to show modesty too, a girdle would have to cover its thigh area, even a hint of “crotch shot” had to be covered up with a scarf. In the 1960’s Playtex launched their TV ad for the “Cross-Your-Heart Bra”, featured on a dummy. Jane Russell famously starred in one of their TV ads in the 1970’s, (again using a bra clad dummy) describing the bra’s structural advantages for “fuller-figured gals”. By 1969 censorship had relaxed somewhat and Wonderbra launched the first TV commercial in North America showing an actual woman’s torso, naked except for a bra! By the 1990’s the “Hello Boys” Wonderbra poster featuring Eva Herzigova and her spectacular cleavage was being accused of causing numerous car crashes when first unveiled. Recently it’s been named the number one outdoor advert of all time and present-day bra adverts haven’t really changed much since then. Enjoy perusing these vintage lingerie media snippets! Do you have any fabulous lingerie ads you want to share? ← Previous Story Anatomy of a bra! in the 1990s there was an ad campaign for lingerie, black n white , possibly wonderbra, one of the ads catchphrases was ” hurry up or ill start without you” against a backdrop of a lingerie clad beauty lying on a bed provocatively, can you help me trace the ads as i would like to purchase the prints series. many thanks, grant maclaine. Thanks for your comment! Sounds like a nice bra ad with a vintage feel – very nice! Hi there, I found your site on Google while looking for a similar info, your website came up, it looks good. I have bookmarked it in my google bookmarks. Thanks! Much appreciated 🙂 Feel free to add us on Twitter (@nowthatslingeri) and Like our Facebook page! We looked and are unable to find the ad you are referring to. If we ever come across it, we’ll be sure to notify you. 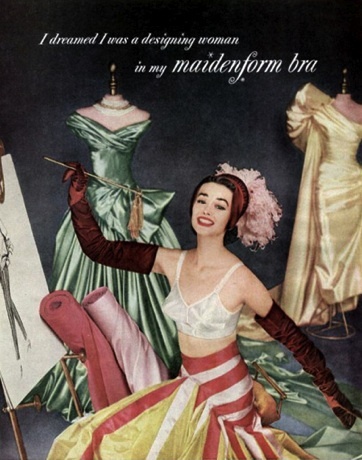 What do you know about Maidenform Bras adds of the ’50s and “60s? 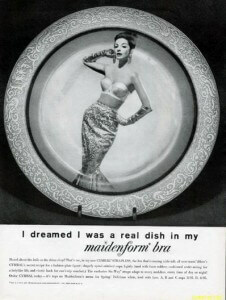 I have a trinket tray with the image of the “I dreamed I was a real dish in my Maidenform Bra with a woman wearing a bra but otherwise, dolled up with elbow length gloves.